Telescopic ladders are the worlds most innovative and flexible ladders you can buy, they have been awarded the most prizes for its revolutionary design & concept. While ordinary ladders are always too long to transport this ladder can fit into the boot of a car and when you need to climb up a the ladder, all you need to do is pull out your telestep, step by step, to the length you need to reach comfortably up to 3.8 meters. In just a few seconds you have got a stable and comfortable ladder you can rely on in all situations. This ladder is EN131 approved and complies with European safety standards. Total Length extended 10 and 12ft. Adjustable in 10 different lengths. (1) All of our aluminum material are bought from large state-owned factory. (2) All of our aluminum material are made of 100% aluminum ingots. Never use recycle aluminum. (3) Aluminum alloy: 6063/T5.Thickness :2.2mm and 1.3mm. (1) 100% new material. Never use recycle plastic. (2) Our telescopic ladder plastic parts never break, because we improve their toughness by special treatment. (1) Each telescopic ladder must pass professional inspection before leaving factory. Open telescopic ladder, then put them as platform and put 150KGS goods in the middle. After 30 hours, Check extend and fold function. Five points to fixed the pipe and the treadboard. Two holes to fixed the the plastic. and avoie to scratch the surface of pipe. Make hard to reach jobs easier to be done. gutter cleaning, DIY activities etc. with free scaffold plates. Platform can be set half way on the stairs. Can be turned into step ladder or straight ladder. Top end can be easily folded and stand ladder off the wall. Made of rust proof, light weight aluminium. With a load capacity of 150kg. Manufactured to SGS, EN131 part 1 and 2 specifications, and safety certificates. 8 in 1 multi purpose. This multi-positional ladder is probably the only ladder you will ever need. Ideal for jobs around the house, workshop and garden. It's unique multi-positional hinge system enables this ladder to easily transform into many different configurations. 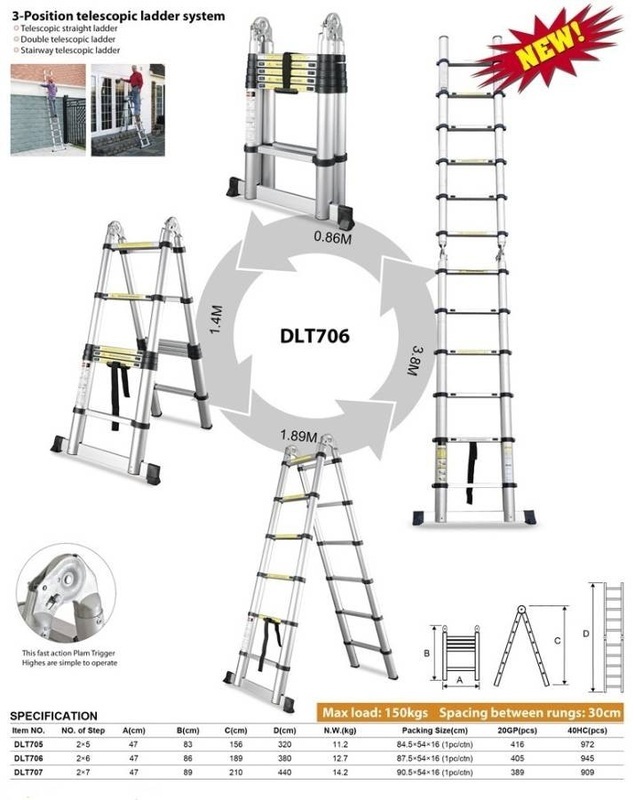 Robustly manufactured this ladder is suitable for heavy duty use.